But the main thing is: it tastes wonderful. 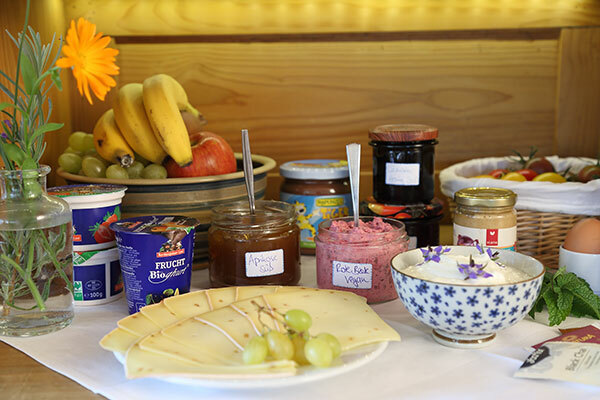 The Awakefest, our breakfast buffet, is varied, healthy and vegetarian, the ingredients are all organically grown and many homemade and gathered by hand. Besides this substantial and balanced buffet, we surprise you every day with a special “breakfast delicacy” for example: fried tofu, apple-carrot crudités, green smoothies, fresh-grain porridge or warm semolina pudding. With our in depth knowledge and expertise and lived passion for food, we would be delighted to answer any of your questions on healthy nutrition in a conversation or consultation at any time. Do you prefer a vegan or raw-food breakfast? Then just inform us in advance before your arrival, so that we can thoroughly spoil you during your stay. … and that the smile doesn’t leave your lips for the rest of the day.